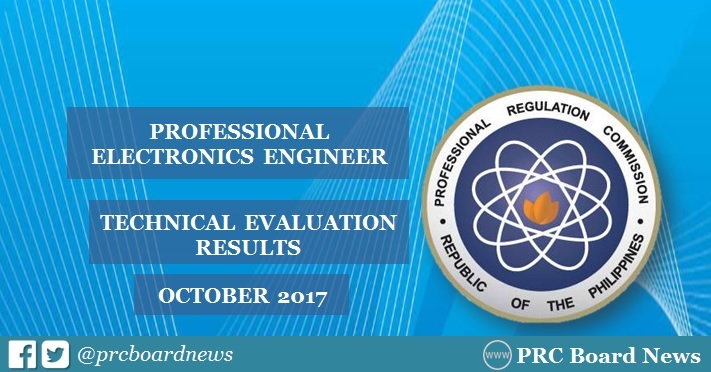 MANILA, Philippines - The Professional Regulation Commission (PRC) released the results of October 2017 Electronics Engineer (ECE) board exam together with the results of technical evaluation for the upgrading to Professional Electronics Engineer (PECE). The members of the Board of Electronics Engineering who gave the exam are Engr. Alnar L. Detalla, Chairman, Engr. Enrico Claro R. Delmoro and Engr. Herminio J. Orbe, Members. In October 2016, a total of 72 applicants passed the PRC evaluation. Meanwhile, 49 successfully hurdled the test in the April 2017 exams. Applications for registration as Professional Electronics Engineer (PECE) include an oral interview of the applicant for the purpose of verifying, authenticating and assessing the submittals and establishing the competency of the applicant according to rules, regulations and competency standards to be formulated by the Board.